Gamers in the house will be well aware that Mass Effect 3 is launching next month, and it will be adding a lot of new tricks to the established sci-fi game franchise. One of those tricks is going to be a third-person shooter for iPad and iPhone called Mass Effect: Infiltrator, and playing it will not only be a lot of fun in its own right, but will advance your progress in the Xbox 360, PlayStation 3, and PC game as well. As far as I'm concerned, this is the single best implementation of cross-platform gaming I've seen to date. I've seen way too many game developers simply try to drag and drop the experience from consoles and PCs to mobile, but it's obvious that Mass Effect's developer, BioWare, understands that gaming on mobile is a different experience. Infiltrator looks like it will still be action-packed, but the fact is, gamers aren't going to be spending hours on end playing it as they might on their proper gaming rigs. Datapad in particular looks like it will be a great way to stay involved in the game even if you can't dedicate the laser focus needed for pitched combat. The closest any other developer has come to giving this high-quality interplay between gaming platforms is Call of Duty: Elite, and even that hinged on a subscription service to get the full functionality. Mass Effect: Infiltrator involves rescuing prisoners from a human supremacist group on a hostile arctic planet, while collecting evidence to advance a war effort spanning lightyears. You'll find a bunch of the same weapons and powers in Infiltrator as you would in any Mass Effect game, and likewise, you'll be able to unlock items in the Xbox 360, PlayStation 3, or PC versions of the game by playing on your iPhone or iPad. 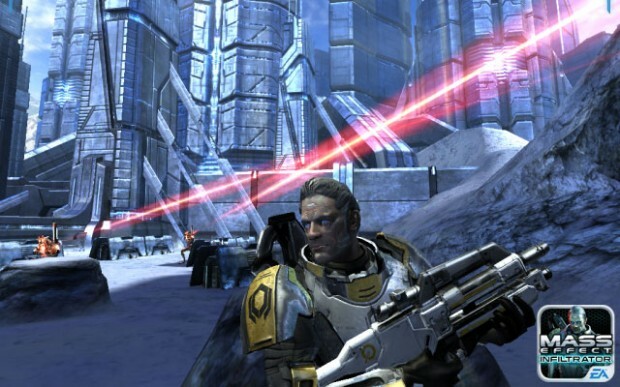 Gameplay in Mass Effect 3 will be extended in multiple directions through a system they're calling Galaxy at War. The game's single-player story involves you fighting an intergalactic threat called the Reapers. By playing Mass Effect: Infiltrator on iOS (or co-operative multiplayer in the full game) you increase a score called Galactic Readiness, which will ultimately influence the final conclusion of the core campaign against the Reapers. There will also be an iOS app called Datapad to keep tabs on your Galaxy at War progress, and allow you to deploy troops to particular regions of space, as well as get messages from in-game characters. Combined with the cool Xbox Kinect controls Mass Effect 3 is going to offer, I'll be having a really hard time saying "no" to this game when it comes out March 6. Be sure to check out some of the sweet trailers at BioWare's site.